Tom Harris is injured in a high school football game and ends up in the hospital. Tanner Knox says he’ll make sure Tom receives reparation for what happened. She located the remote at the back of Tom’s bed and handed it to him. “It’s easy to use. All the buttons are labeled. There should be a card with instructions about how to use it and what channels are available.” She found it and handed it to Tom. “Yes,” Danielle said. “There’s a card with the password. I’ll get one for you.” She stepped out to the nurses station and returned with the card and handed it to Tom. “Tanner, are you ready to go home?” Danielle asked. “Yes. What time will they be here?” she asked. Tanner and his mom said goodbye to Tom, and they left for home. When he got home, Tanner needed to plan what he’d do when he went to school on Tuesday. He knew it wouldn’t be the same as usual. There’d be a lot of questions about what happened to Tom, so he’d need a way to tell the story about what happened to him. The best way would be to summarize it, then tell that version to everyone. He wrote what he wanted to say, then edited it and re-edited it a couple times. Then he committed the final summarized version to memory. Then he worked on his homework assignments and studied for his Chemistry test. Tanner and his family ate dinner and talked about what happened to Tom and what Tanner was planning to do about it. “Tanner, I suggest that you wait until you’ve discussed this with your coach before contacting your uncle Gerald,” his dad said. Tanner made the call to his uncle. He repeated the story about what happened to Tom, and that he’d talk to his coach on Tuesday about what the CIF and NCS would handle. The most important thing would be to get a copy of the video of the game and see if it showed what happened to Tom. “What does Tom want to do about it? Does he have an idea?” Gerald asked. “What he wants is to have Nick Poulter suspended, the Ealington coach and the official who watched Tom being targeted and fouled to both be fired, and to get restitution for Tom since he ended up in the hospital and wouldn’t be able to play football the rest of this season and maybe never again. “Thanks for your help, Uncle Gerald. I’ll be in touch later. Bye for now.” Tanner ended the call, and he and his mom left for the hospital. On the way, she had questions about what Gerald told him. “He said it sounds like Tom has grounds for a personal injury lawsuit against Ealington High School. He can sue because the injuries he suffered in the attack will prevent him from playing football this year and maybe in the future, too. “It depends on the video. It’s gotta show Tom being attacked by Nick Poulter. I won’t know that until I see the video, and that assumes that it exists. We’re supposed to be making videos of our home games — this was a home game — so I have to ask Coach Reynolds about that. I assume the video was taken by students from the videography class, so I don’t know how good the quality would be. “I’m not going to tell Tom anything about talking to Uncle Gerald. I’ll wait until I’ve talked to Coach Reynolds and Coach Oldham. They both saw what happened to Tom as it was happening, and I was right there next to them. They were livid, most of all because the official didn’t call a foul. “The thing is, what’s needed is actual evidence that it happened, not just from those of us who saw it because we’re all connected to Edison High. “Because he’s in Sacramento and we’re in Walnut Creek, Uncle Gerald said someone in our area should represent Tom. I think that makes sense because meetings between the attorney and Tom and witnesses will be easy to set up if Tom’s attorney is here compared to being two hours away in Sacramento. “These things can get very complicated,” Tanner’s mom observed. When they arrived at the hospital, Tanner wondered if they were too early. He mentioned that to his mom. When they got to Tom’s room, the door was open and they could hear Tom talking. Tanner knocked on the doorjamb. They introduced themselves then, much to Tanner’s surprise, Linda Jackson grabbed him in a tight hug. She grinned when she saw that the hug confused him. Tanner suppressed a laugh because he recognized the Jacksons were serious, and he didn’t want to offend them. But he’d never agree that he had saved Tom. He hadn’t done much, just call a cab and make sure Tom got to the hospital. “Thank you. Tom’s a great guy, and we’re best friends.” Tanner saw Tom’s pleased expression. “We’re so glad to meet you, Tanner,” Linda Jackson said. “Tom has been talking about you all evening.” Tanner blushed, which was something he seldom did. “Did you get your laptop?” Tanner asked. “Tell us about what you saw when Tom was hurt in the game Friday night,” Mr. Jackson asked. So that’s what Tanner did. As planned, he left out that he had talked to his uncle, but talked about his plan to meet with Coach Reynolds during seventh period PE on Tuesday and find out if he could get the video, and what he hoped the video would show. “I hope the video shows at least part of the details of what happened to Tom,” Paul Jackson said. The adults chatted about school and living in Walnut Creek and the Knox’s recent move from Hayward, what Danielle Knox did at the hospital, Tanner’s plans for college. There was more general chit-chat of the sort that adults seemed to do all the time. To be polite, the boys listened with limited interest. “I agree,” Tanner’s mom said. “Tom, we should thank this boy when you get home,” Linda Jackson said. “We should have him come and visit us.” That started a general discussion about how much what Calvin did had helped both Tom and the other boys. “It seems I almost always have homework I need to finish,” he replied, and he and Tom both laughed. They said their goodbyes, and Tanner reminded Tom that he’d see him on Tuesday after school. If you enjoyed reading this story, please let me know! Authors thrive by the feedback they receive from readers. It's easy: just click on the email link at the bottom of this page to send me a message. Say “Hi” and tell me what you think about ‘Reparation’ — Thanks. 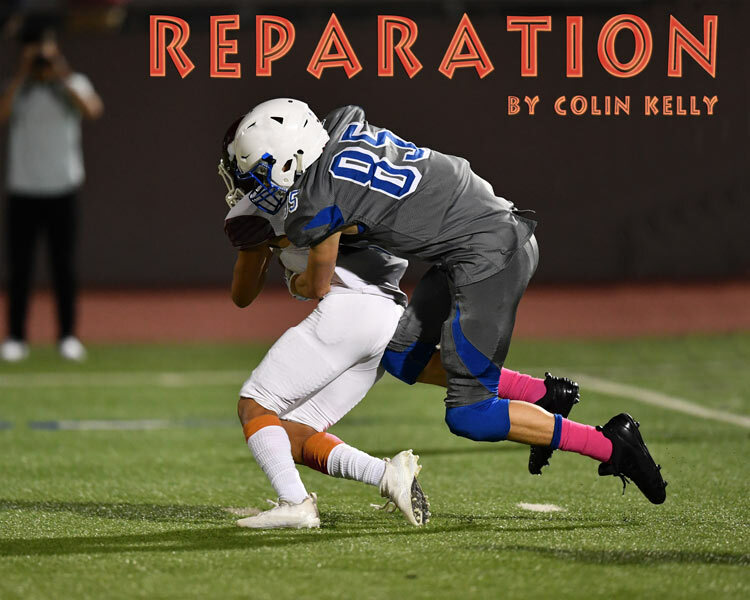 This story and the included image are Copyright © 2019 by Colin Kelly (colinian). The original image is Copyright © by Joe | Adobe Stock File #230846107. They cannot be reproduced without express written consent. Codey's World web site has written permission to publish this story and has licensed use of this image. No other rights are granted.